It had been billed in some quarters as a ‘must-win’ game, and while not quite that crucial, the home defeat to West Ham last night is a major set-back. With four straight defeats, three of those at Bloomfield Road, ‘Pool now find themselves unerringly close to the bottom three. A win would have seen the Seasiders go 10 points clear of West Ham, instead of the four point gap that now exists. It’s nothing to be ashamed of necessarily – after all some pundits would have had you believe ‘Pool would have been all but relegated by this point – but from what appeared to be building up to a comfortable mid-table finish, Ian Holloway’s men are now in a relegation fight. There are a number of reasons for last night’s defeat, but an absence of luck probably isn’t one of them. Questionable team selection, poor individual performances and sloppy mistakes resulted in a first half as bad as any witnessed on the Fylde coast this season. Holloway made two changes from the team that tested Manchester United to the limit last week, the casualties being Elliot Grandin and Ian Evatt. David Carney and new signing Andy Reid were the beneficiaries, but the decision to drop Evatt, thus unsettling the defence, seemed to spectacularly backfire. The return of Carney was to be expected, with Alex Baptiste the square peg in a round hole at left-back when the side from Old Trafford were the visitors. Evatt however has been a lynchpin of ‘Pool’s backline, and aside from being caught out at the Emirates has excelled despite the step-up to the Premier League. Rumours of off-field antics could explain Evatt being dropped, but it meant a defensive unit that looked like strangers. In addition to Reid not quite being a like-for-like replacement for Elliot Grandin (as highlighted by Tangerine Dreaming), Blackpool were unbalanced. 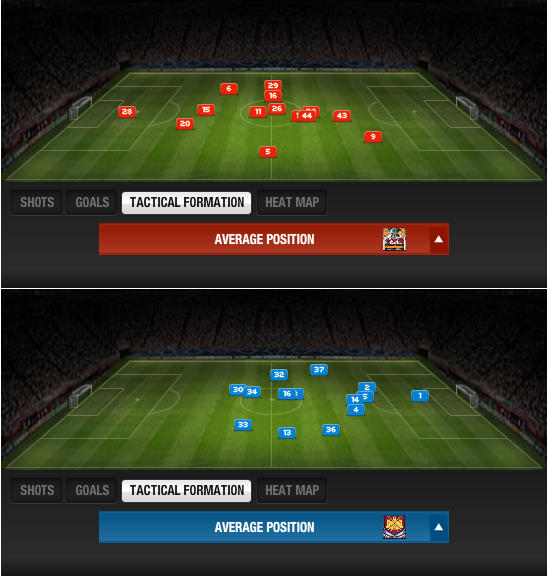 The diagrams below show the average positions of the Blackpool and West Ham players and display a stark contrast. Where the Hammers set-up offers clarity, ostensibly a rigid 4-4-2, the average positions of the Blackpool players helps identify why the Seasiders struggled to match their opponents from East London. Neal Eardley (5) is horribly exposed, and would explain why Victor Obinna (33) gave him such a hard time. Eardley typically relies on support from Gary Taylor-Fletcher (12, hidden behind 44, Beattie) and the absent Grandin. On Wednesday night Taylor-Fletcher was often found drifting inside, while Reid (43) as a left-footer did not give the former Oldham right-back adequate protection. 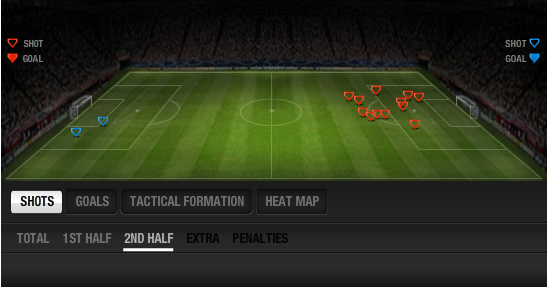 The average position map also shows a severe lack of width to Blackpool’s attacking play. Luke Varney (16), whose form has worryingly nosedived in recent weeks (highlighted in my West Brom review), failed to get into his usual positions out wide high up the pitch with Carney (29) playing just as high up as his sound-alike teammate. Equally Taylor-Fletcher did not provide any sort of width on the right, nullifying ‘Pool’s usage of those famous long diagonals. Referring again to Tangerine Dreaming, the Guardian chalkboard of Blackpool’s passes from open play highlight the lack of width to the Seasiders’ performance, with Tangerine Dreaming citing Carney’s lack of adventure in getting forward as another explanation. In terms of the formation and the roles of players filling in for regular members of the team, Holloway has some work to do on the training ground. Despite the poor first half performance, ‘Pool did not throw in the towel and sought to take the game to West Ham after the break. Attacking changes were made on hour mark in the form of Marlon Harewood and a debut for James Beattie, replacing the tiring Reid and disappointing Varney. This naturally resulted in a more basic gameplan – Blackpool being more direct with big targetmen to aim for. In terms of sheer numbers, this saw ‘Pool have 12 shots to West Ham’s two, as shown by the diagram below. Despite the quantity of shots, in terms of clear-cut chances ‘Pool had very few, rarely testing Rob Green in the West Ham goal. The closest the Seasiders came was Eardley’s free-kick, other chances being speculative shots from distance or goalmouth scrambles. For all Blackpool’s pressure, they lacked the creativity in the final third to break down a resolute West Ham defence. To witness just how well the Hammers defended, one need only look at the number of second half clearances made by Avram Grant’s side. An incredible 26 successful clearances were made in the final 45 minutes, with a further 13 attempted. West Ham don’t do anything spectacular in terms of tactics, but Grant clearly had them well-drilled, which when combined with superb individual performances from the likes of Obinna, made them very effective. The Hammers were good value for their three points and few Blackpool fans would have gone home feeling hard done to. Blackpool move onto Goodison Park on Saturday and Holloway will be eager to halt the slide. This result however is sure to give him a selection headache against Everton, and I for one wouldn’t care to predict what the starting line-up will be on Saturday. Changes do need to be made however, Varney and Richard Kingson two names that instantly spring to mind. Kingson’s errors are beginning to add up and are proving costly. As for Varney, he is vulnerable with the increase in attacking options at Holloway’s disposal. Another game coming around so quickly is possibly the best thing, as it shouldn’t allow the negativity following this defeat to linger. A positive result there would quickly dispel the nervousness that is beginning to creep in.